This guy is fantastic! The Freshman Senator from Georgia, David Perdue, may not be running for the presidency, but he sure could – he’s far more popular than Jeb Bush. In fact, he says he views things just as Donald Trump does. He’s for a flat tax, term limits, jobs and reducing the debt. He’s for a strong military and knocking the crap out of ISIS. And this guy can give a killer speech. He’s for a return to Constitutional principles and for reigning in Obama and his executive orders. No more bypassing Congress – we have three branches of government for a reason… to keep tyrants in check. 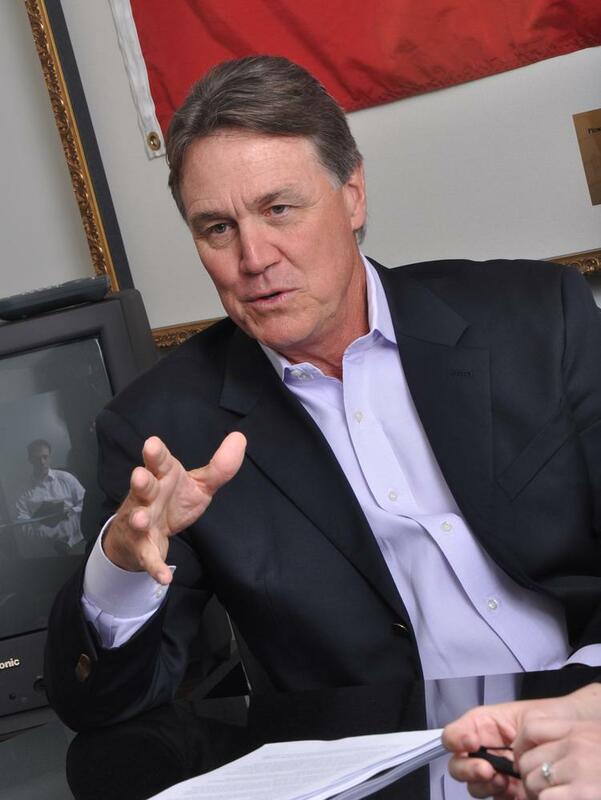 Perdue wants government agencies reformed and eliminated. He’s for energy independence. It’s time for America to return to being a world power once more and to honor our allies and obligations. Enough of the Progressive’s one worldview – the cure is capitalism as it should be practiced and making America great again. Six years of Democratic control of the White House have saddled America with constitutional, global security and economic crises, freshman U.S. Sen. David Perdue, R-Ga., declared Friday. Speaking to about 3,000 conservatives at a summit in Columbus, Ohio, hosted by Americans for Prosperity, Perdue charged President Barack Obama with bypassing Republican majorities on Capitol Hill with a series of executive orders and agency regulations that overstep his constitutional authority. Perdue also accused Obama of creating the conditions that led to the formation of ISIS by prematurely pulling U.S. troops out of Iraq in 2011 and criticized the nuclear deal the White House recently negotiated with Iran, which is now before the Senate. “We’ve created a climate where our friends don’t trust us and our enemies don’t fear us,” Perdue said. Perdue called on Congress to enact the “fair tax,” a plan to replace the federal income tax with a national sales tax long championed by former U.S. Rep. John Linder, R-Duluth. He also spoke out in favor of congressional term limits, a proposal he talked about frequently on the campaign trail last year, and in support of domestic energy solutions including the proposed Keystone Pipeline. Attendees at the two-day summit, which began on Friday, will hear from several Republican presidential candidates, including former Florida Gov. Jeb Bush, Sen. Ted Cruz of Texas, Sen. Marco Rubio of Florida and former Texas Gov. Rick Perry. Americans know that the corrupt Washington Cartel is not working. We need more citizen legislators instead of career politicians. Less is more here… less government, less spending… more military, more jobs… it’s not a Gordian Knot. You can cut to the heart of the matter with simple economics and security. They say that outside is the new ‘in’ in conservative politics these days. David Perdue fits the bill. He’s an outspoken, uber conservative, a businessman and brilliant. “I’ll tell you, it’s a miracle I got through the political process,” Perdue said. “The political process is not set up for outsiders to be successful. From the money standpoint to the political insider standpoint.” Perdue called out many of his fellow Senators, who he says have become ingrained in the political process for too long and now contribute to Washington’s brokenness. Perdue is right about that and so much more. Six years of Democratic control of the White House have saddled America with constitutional, global security and economic crises. We need more like him to turn America around.